The Acura MDX has come a long way. Since its debut for the 2001, it has blossomed as the flagship SUV of the luxury-oriented Acura brand, with three rows of seats, a comfortable ride, outstanding handling, and loads of advanced safety features. The MDX got a major facelift in 2017, but that hasn't stopped Acura from the constant refinement of the third-generation model. An A-Spec®-equipped variant joins the base-level model and Technology, Advance, and Entertainment packages. 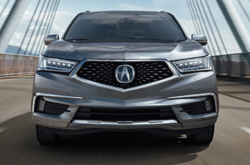 The Advance MDX now has continuously variable suspension dampers, and Acura revised the calibrations for the vehicle's transmission programming and engine idle-stop system. What Features and Trims does the MDX Have? 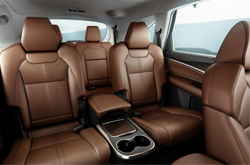 The base-level Standard trim, provides a leather-trimmed interior with 12-way power-adjustable heated sport seats and power lumbar support at the front. The Technology packages gives a boost with perforated leather with contrast stitching. Front-seat ventilation with upgraded Milano leather-seat trim and alcantara®-trimmed interior-complete with contrast stitching and piping-is added with the A-Spec® and Advance packages, and heated rear seats appear on the Advance and Entertainment models. Although regular maximum seating is for seven people, only the Advance variant switches the bench-style seat in the second row with a pair of captain's chairs to reduce it to six; it is also the only variant with a heated steering wheel. 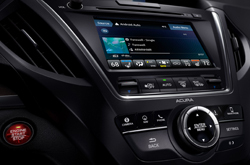 For comfort and convenience, the 2019 Acura MDX starts with features such as tri-zone automatic climate control, an 8-inch color display and an on-demand multi-use screen, a keyless access system with smart entry and push-button ignition, Bluetooth® wireless technology, a multi-information display (MID), active sound control and ambient cabin lighting, an automatic-dimming frameless rearview mirror, a garage-door opener, eight-speaker audio, a USB port and an audio jack for audio integration and four additional USB ports for charging mobile devices, a single-disc CD player with MP3 and WMA playback compatibility, HD Radio®, and Apple CarPlay™ and Android Auto™ for smartphone integration. 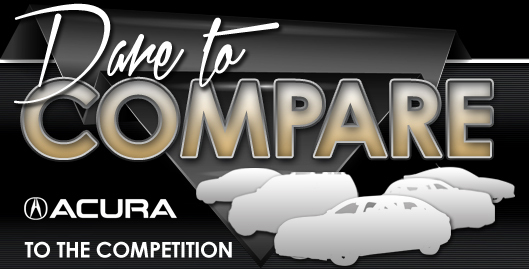 The Technology package enhances the MDX with features such as remote engine start, Siri® for voice recognition, navigation system with 3D viewing, 10-speaker audio, Song By Voice® voice-command technology, and a color MID with turn-by-turn guidance (in place of the regular MID). The Advance goes further with a multi-function center console in the rear (in addition to one in the front) and two additional charging-only USB ports (in the third row). The aptly-named Entertainment spruces up the infotainment specs considerably with 11- or 12-speaker audio (with Technology or Advance package, respectively), two wireless headphones, a 9-inch full VGA screen (with the tech package), and a 16.2-inch ultrawide full VGA screen and HDMI compatibility with addition of the Advance package. Powering the 2019 MDX is a 3.5-liter, 24-valve V6 that produces 290 horsepower and 257 lb-ft of torque. 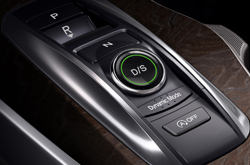 It is joined to a 9-speed automatic transmission with paddle shifters. Only the A-Spec® has standard all-wheel drive; the other packages give you the option between that and front-wheel drive. For restraint and cushioning in the event of a crash, the 2019 Acura MDX comes with a pair of front impact airbags, two front seat-mounted side-impact airbags, a driver's knee airbag, and side curtain airbags that flank all three rows. There's also a multi-view rear camera with rear parking sensors, a four-wheel anti-lock braking system with electronic brake distribution and brake assist, electronic stability and traction control, all-wheel disc brakes, hill start assist, auto high beams and LED daytime running lights, lane keep assist, adaptive cruise control, collision mitigation braking, road departure mitigation, forward collision warning, and lane departure warning, among other safety and security features. The Technology package adds blind spot monitoring with a rear cross-traffic monitor, as well as front parking sensors. The Advance supplants the rearview camera with a surround-view one and adds a heads-up warning system. Visit us today to take a peek at the 2019 Acura MDX and ask any questions you might have.